Palenqueras slowly walk Cartagena streets offering: Papaya, watermelon, pineapple, guava, mango, nísperos (louquats) and more. They sing their tune as they gracefully cover downtown and the beach areas. Songs start with a low cord and they go up as they list the many fruits they carry on top of their heads. 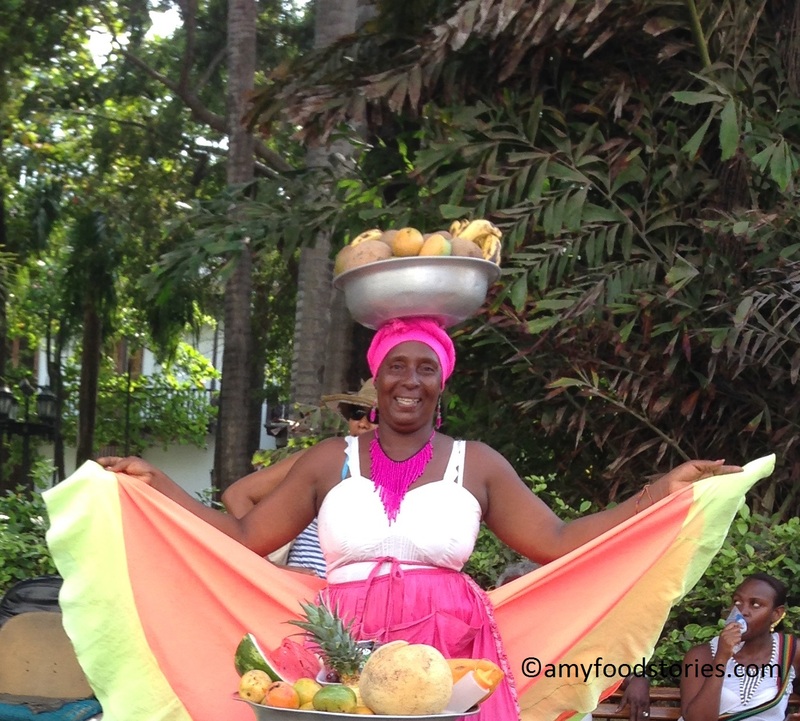 The song goes like this: “Home-cooks come get mangos, guavas, watermelon and tamariiiindo…. ” It’s amazing to see their beautiful, generous smiles. Palenqueras are native from San Basilio de Palenque, a village near Cartagena, in the Municipality of Mahates, Bolivar, with a population of about 3,500 Afro-Colombians. Regarding its origin, during the 16th century Spaniards and slaves traveled together to South America. As slaves escaped, they slowly settled as this village came to be founded. Since then, Palenque natives have kept their traditions, language (similar to Creole) and their Afro-Colombian race intact. It’s truly a privilege to have such cultural richness so close to home! Often I remember how I used to listen to them very early in the morning. Daily, Palenqueras carry centuries of history as they patiently make a living selling fresh fruits. To read this post in Spanish click here.